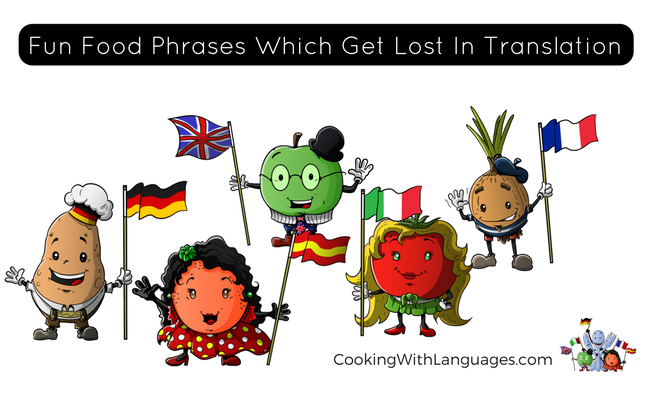 Let’s have a look at some Fun Food Phrases from around the world! 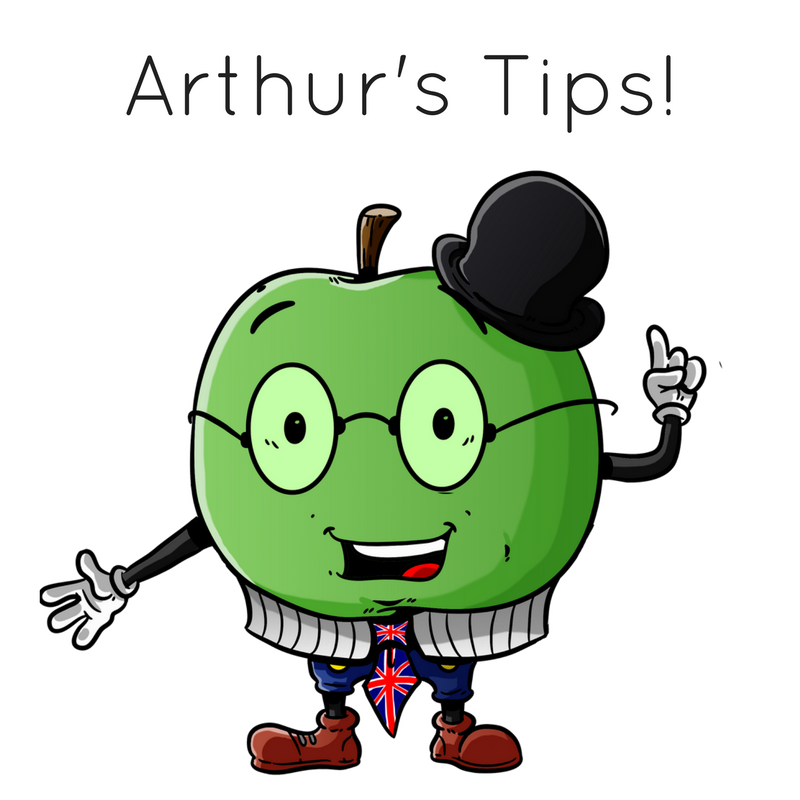 From angels tiddling on your tongue to sliding on a prawn sandwich, food has played a starring role in sayings around the world. No celebration is complete without food, so let’s play tribute to the wonderful way our cuisine helps to shape our culture and literature. From the Mad Hatter’s tea party in Alice in Wonderland to the romantic film “Chocolat”, food has stirred the emotions from comic moments to sheer horror . (Can anyone hear the words liver and Chianti in the same sentence without conjuring up images of Hannibal Lecter?). So it’s no wonder that food also features heavily in phrases and sayings around the world. We’ve heard some strange ones in our time and we’ve picked our top 10. 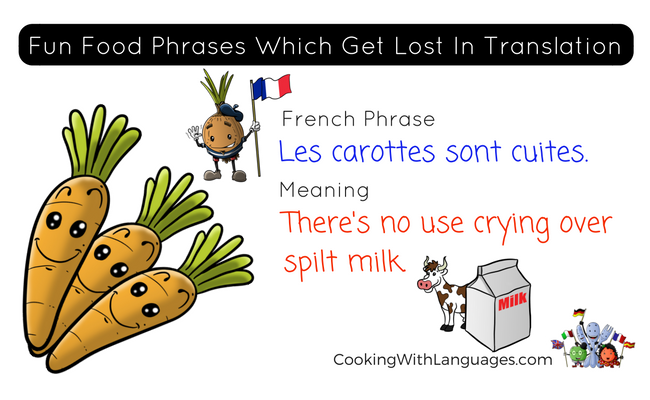 In France they say ‘les carottes sont cuites’ meaning ‘the carrots are cooked’. It’s a curious way of telling people to move on. What’s done is done, it cannot be changed so accept it. In English, we would say ‘there’s no use crying over spilt milk’ to indicate you can’t undo what’s happened. ‘Att glida in på en räkmacka’ is Swedish for ‘to slide on a prawn sandwich’. It refers to someone who’s lived on Easy Street making money and rewards without having to work for it. It reminds us of when former Manchester United captain Roy Keane hit out at the prawn sandwich brigade who turn up to football matches to sit in the corporate boxes, enjoy the hospitality but not get behind the team. Food is often used to describe being in a crowded place – jam-packed or to be packed like sardines which are tightly squashed into those little tins. The Japanese turn to tubers to describe the sensation by saying ‘Imo wo arau y?’ – ‘like washing potatoes’. 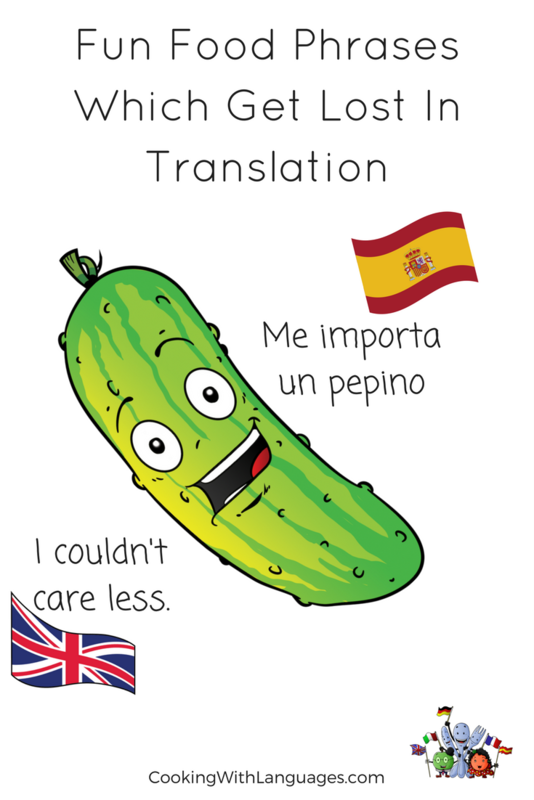 ‘Me importa un pepino’ literally translates as ‘a cucumber is important to me’ but what someone actually means is ‘I couldn’t care less’. It’s similar to the English saying ‘I don’t give a fig’. We suggest when you try this in Spain, you shrug your shoulders for extra emphasis. In Poland, they like their sayings short and sweet. ‘Bulka z maslem’ means ‘bread and butter’ and signifies easy work or a walk in the park as we’d say in Britain. I suppose it’s as easy as spreading butter on your bread. 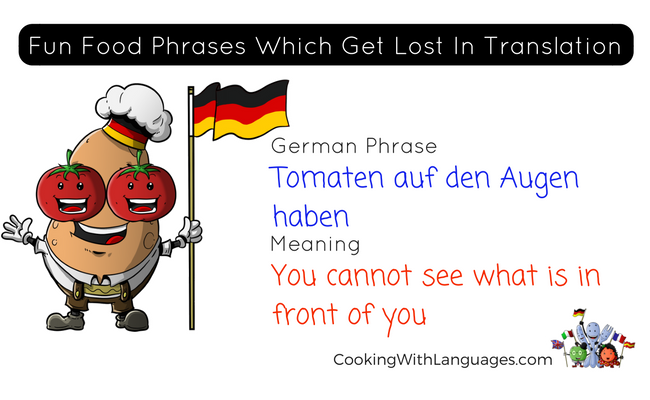 If someone is not seeing what is plainly in front of them, they’re said to have tomatoes on their eyes in Germany – Tomaten auf den Augen haben. It means you’re not aware of a situation or paying attention. Even stranger is the German saying, ‘alles hat ein ende, nur die wurst hat zwei’ – ‘everything has an end; only a sausage has two”. This is an old saying which became even more famous through a song by German musician Stephan Remmler in 1986. It means everything comes to an end (except the sausage of course). ‘Iets voor een appel en een ei kopen’ translates from the Dutch as ‘buy something for an apple and egg’ to imply you’ve bagged yourself a bargain and bought cheaply. Even more expressive is the Dutch phrase ‘alsof er een engeltje over je tong piest’ – as if an angel wees on your tongue. It’s a delightful way of saying the food tastes divine. We think this is a naughty but nice way to describe the sensation of eating quality food. You would expect the Italians to have plenty of sayings referring to food – and you’d be right. 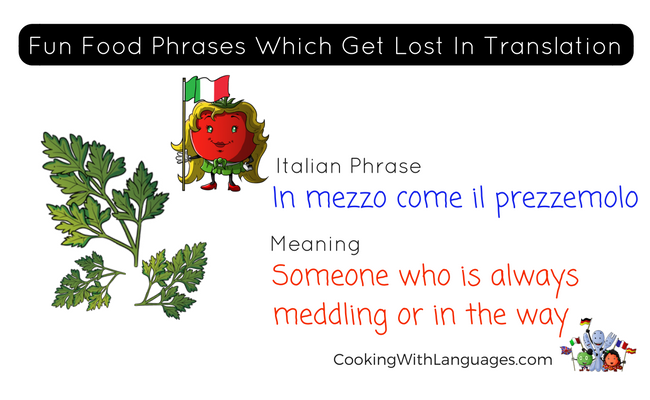 A common saying is ‘in mezzo come il prezzemolo’ meaning ‘to be in the middle of everything, like parsley’. You would use it to describe someone who is always meddling or in the way. Parsley is sprinkled liberally over many dishes and is the top garnish in many restaurants, therefore it makes perfect sense to use this herb as a metaphor in this manner. 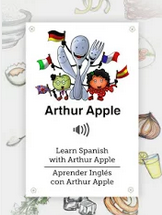 Learning about different countries, cultures and customs is a really fun way to help us learn languages. 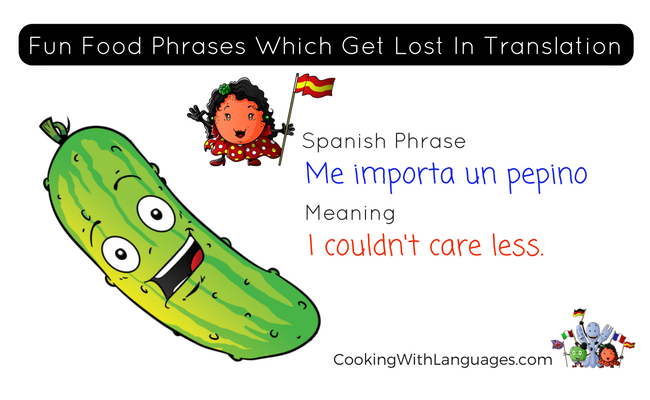 What other fun food phrases do you know? Please share them with us! 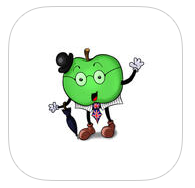 THANK YOU for bringing our fun language learning project to life by supporting our Crowdfunder campaign. !! !